Japan is not releasing any economic data but the US will publish Crude Oil Inventories, Pending Home Sales m/m, Prelim Wholesale Inventories m/m, Goods Trade Balance, Final GDP Price Index q/q, and Final GDP q/q. The support rests at 105.240 with resistance at 105.770 which the weekly pivot point at 105.320 is located in between the lines. The EMA of 10 is moving with bullish bias in the ascendant channel and it is below the EMA of 200 and the EMA of 100. 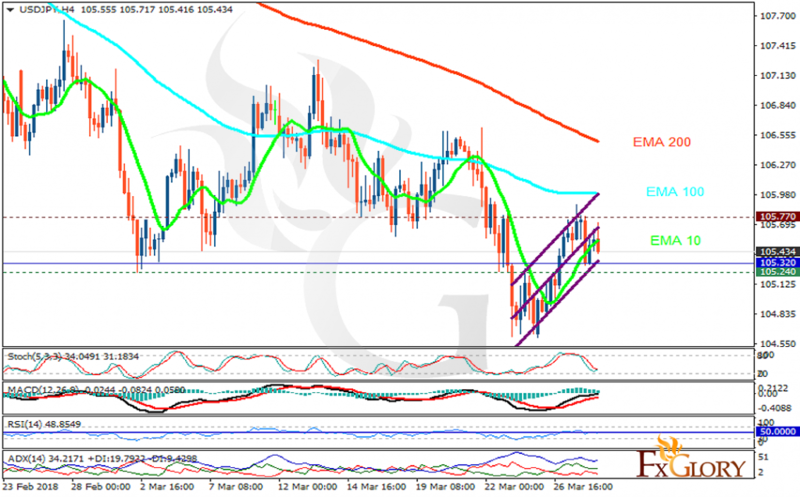 The RSI is moving on the 50 level, the Stochastic is moving in low ranges; showing upward momentum and the MACD line is above the signal line in the positive territory. The ADX is showing buy signal. Long positions are recommended towards 106.2.